Take your marriage to the next level at a Weekend to Remember® Marriage Getaway! This is more than just an escape from your busy schedule for a romantic weekend for you and your spouse. This is your chance to discover exactly how incredible your marriage can be by gaining new insights into God’s perfect plan for married life. At Weekend to Remember, you’ll learn to connect with your spouse more intimately, understand God’s blueprints for a wonderful marriage, and draw from the experience and advice of leading marriage experts. Start making plans for a Weekend to Remember today! Notes: The event sessions were moved across the street to the Renaissance Montgomery Hotel due to construction on the meeting rooms at the Embassy Suites. Sleeping rooms are still available at the Embassy Suites. 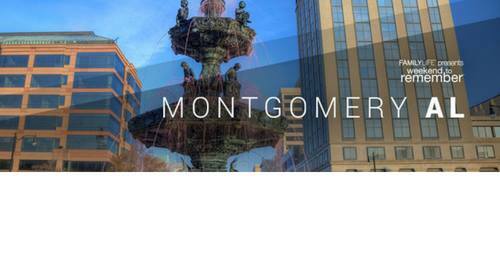 For basic rooms at Renaissance Montgomery Hotel located at 201 Tallapoosa St, Montgomery, AL 36104. Phone (334) 481-5000. Mention that you are with the FamilyLife Weekend to Remember. Event begins Friday 7- 9:35 p.m. Then Saturday 8 a.m. - 4:40 p.m. and Sunday 9 a.m. - 12:15 p.m.